What if it’s all about the money? Here’s a special edition of “Afterhours” where Joe plays a little Saturday night guitar and talks about Syria, Politics, and Manipulation. Author joecrummeyPosted on April 9, 2017 April 9, 2017 Leave a comment on Conspriracy Mania! After launching 59 cruise missiles into Russia’s favorite client state, is his bromance with Vlad on the rocks? Author joecrummeyPosted on April 7, 2017 April 7, 2017 Leave a comment on Trump’s Twofer! Who’s behind the Syrian Chemical Attack? The Media wants you to think it’s President Bashar al-Assad. Don’t be so sure. Be suspicious. Think Deep State. Intel. Manipulation. Author joecrummeyPosted on April 6, 2017 Leave a comment on Who’s behind the Syrian Chemical Attack? That’s what Senate Intel member Tom Cotton said. It’s pretty funny given her ridiculous statements about Benghazi, too. Also, President Trump blames the Syrian Gas Attack on President Obama’s feckless foreign policy. Meanwhile Joe has good news about making race relations great again! President Obama’s National Security Advisor, Susan Rice is Busted! Also: hokey drama in the Senate as Al Franken explains why he can’t vote for Trump’s Supreme Court nominee, Neil Gorsuch. It’s the case of The Frozen Trucker! Author joecrummeyPosted on April 3, 2017 April 4, 2017 Leave a comment on President Obama’s National Security Advisor, Susan Rice is Busted! 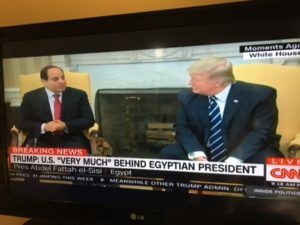 Uh oh, The Orange Haired Demon’s colluding w/ Egypt’s President Abdel Fattah el-Sisi!